Now that winter is setting in and there is a nip in the air, we want to find warming and comforting oils to keep away the chill. Black pepper, strange as this may seem, is a wonderful oil to use in the cooler weather because it has those qualities of warmth and comfort. 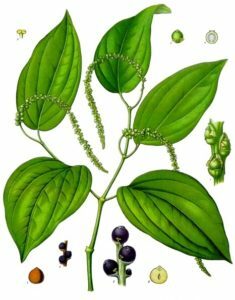 Steam distilled from the dried and crushed fruit, the best essential oil of black pepper, piper nigrum, is found primarily in India. Therapeutically, black pepper is used to stimulate digestion, increase circulation, decrease respiratory complaints and boost the immune system. Black pepper can be taken internally as an herb for digestive problems such as colic, flatulence, constipation stomach pains and food poisoning. When used as an essential oil in massage, it can be mixed with a carrier oil such as olive oil and rubbed on the belly to help with the above complaints. When applying massage techniques to the abdomen, it is advisable to massage in a clockwise movement, which is the natural flow direction of the large intestines. This motion will encourage proper peristaltic action and help to relieve gas pains, stomachaches and bloating. It can also increase appetite. Not only does black pepper aid the functioning of the colon, but it is also a stimulant for the kidneys. By massaging around the kidney area, renal stagnation and sluggishness can be alleviated. Pepper has a strong diuretic effect so should not be over used or it can stress and irritate these organs. Blood circulation can strengthened by black pepper. It is considered a hot oil and good for stagnant conditions like that of arthritis and edema. (But black pepper should be avoided with cases of arthritis with inflammation and excess heat as it can exacerbate the swelling and pain.) As it is so warming, this oil is great for menstrual cramps and bloating and can stimulate the reproductive organs. Good for anemia, it aids in the production of blood cells and therefore is a support during heavy menstrual flows. (Black pepper is considered an aphrodisiac because of its stimulating effects on the reproductive system). Used externally in massage, black pepper is very helpful for muscle stiffness and aches. It is a natural pain killer which works deep into the joints and muscle to reduce acidic buildup and release toxins from the muscle into the blood stream. The toxins are then eliminated more rapidly because of the increased blood flow and stimulation to the kidneys that black pepper provides. This is a wonderful oil for respiratory complaints and can reduce catarrh and mucus because of its drying quality. It relieves the rattling of bronchitis and quiets coughing. It warms the body when there are chills from colds and flu and helps to reduce fever. All in all it is a great oil to use in the winter.